This bar was editorially chosen for inclusion by Londonist, and originally appeared as a review on the main site. Not since the liberation of Europe has the sight of encroaching tanks been embraced like this. Hackney brewery Howling Hops opened the UK’s first dedicated tank brewery recently, confirming that this exciting way of serving beer is firmly parked on the lawn that is London. And just what is tank beer? It’s beer served from attractive, shiny tanks, with the good ‘un’s applied: unpasteurised (meaning the brew forgoes the heating then cooling process used to kill off bacteria) and unfiltered (meaning all the yummy yeast and sediment isn’t sieved out). It’s generally considered to taste fresher, more flavoursome, and to have better ‘mouthfeel’ (something we all care about deep down). The beer may go off quicker, but that’s hardly an issue when you’ve got a public gasping to lap it up by the gallon. Tank beer is nothing new to some European countries like the Czech Republic, where you’ll often see it pumped directly into pubs from a huge tanker, as if it’s unctuous golden oil. Indeed, a few breweries like Pilsner Urquell and Budvar (both Czech) have already stated their claim in the London market with their ‘tankové pivo’ in residence in pubs like The White Horse in Parson’s Green and Zigfried von Underbelly in Hoxton. What’s exciting about Howling Hops’ Hackney Wick venture is that the beer is brewed in London AND that it’s being pumped directly from the brewery behind it, making it extra delicious. We’re also impressed by the range, currently covering pils, rubies, wit beers, IPAs, pale ales, smoked brews and more. But it’s about the ‘theatre’ of drinking too. Some mixologists make a song and dance over the simplest martini, so what’s wrong with having your pale ale poured from something that looks like it fell off the back of Apollo 13? 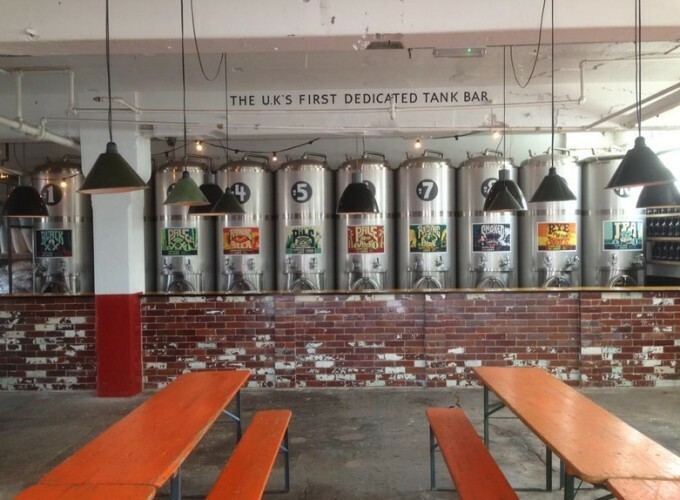 While Howling Hops currently have the only dedicated tank brewery, other London-brewed beer already appears in tank form across the city. Meantime have been selling their beer in various pubs for a while, and Camden Town Brewery are renowned for their summer ‘tank parties’ (although you never quite know if your Hells was brewed in London). Our prediction is much more tank beer to come, or to put that another way, tanks: a lot.